The Cuba 2017 International Book Fair will be inaugurated this Thursday at 9 AM at its traditional venue of the San Carlos de la Cabaña Fortress, overlooking Havana bay and it will run through the 19. The event, dedicated this year to Cuban intellectual Doctor Armando Hart Davalos and with Canada as the Guest Country, will gather over 5 thousand Cuban and foreign guests and over 700 new titles. 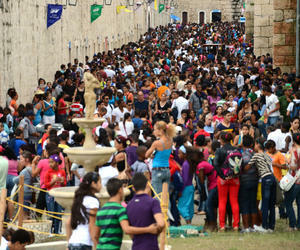 Over 4 million books will fill the stands scattered through the different halls of the ancient fortress where hundreds of thousands of Cubans will have the opportunity to find works of every genre and style. Authors, editors and publishing houses from 46 nations will attend the event; deliver keynote speeches, lectures and exchange with the audience and representatives of the Cuban book industry. There will be special tributes to the late Cuban revolution leader Fidel Castro, including the premiere of documentaries, chats and the launching of 24 titles related to him.